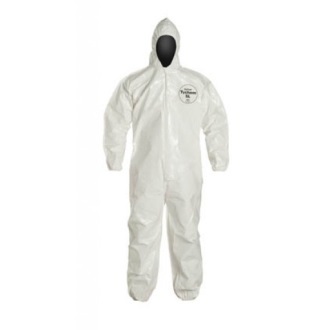 Offering the highest quality available, the DuPont™ Tychem® 4000 suit delivers effective protection against a range of chemical environments. 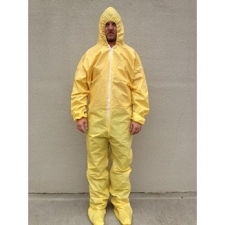 The Tychem® 4000 suit utilizes Saranex™ 23-P film laminated to Tyvek® fabric to provide a rugged and durable fabric that resists abrasion. 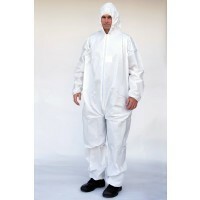 It's high quality fabric provides at least 30 minutes of protection against >124 chemical challenges. 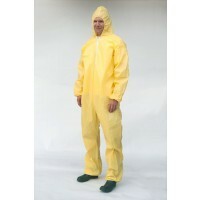 Ideal for use in working environments that will expose you to chemical mixing, hazardous remediation, emergency medical response, paint spraying, and nuclear environments. Featuring a tightly sewn seam, attached hood with elastic around face opening, elastic opening at the wrist to ensure a tighter fit for the wearer, a storm flap covering the zipper which can be sealed by the wearer with an adhesive strip to prevent intrusion and is covered with garment fabric to reinforce seam, further reducing the potential for hazardous particle penetration to the skin.